If a high security building is what you require then look no further. As security is paramount in todays living, Hanson Garages have developed the ‘Fortress’. Fitted with market leading Hormann up and over doors, pre-framed to give consistent performance over the lifetime of the garage. 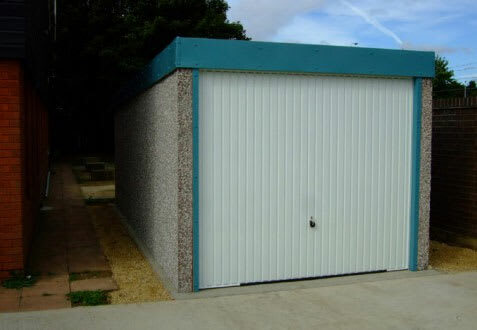 We have added 4 point locking, plastic coated steel fascias and a galvansied steel roof making this building a high security unit and maintenance free. The perfect solution for remote sites, schools or sports clubs. All Hanson Buildings come with Free Delivery and Free Installation. All Hanson Garages concrete panels feature cleverly overlapped and bolted joints along with an internal mastic seal for the ultimate weatherproofing. Whats Included with your Hanson Garage? 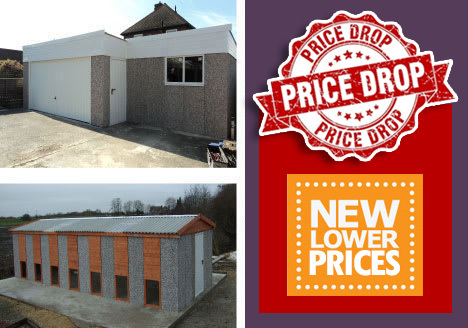 We all want to know that our purchase is going to be great value for money – with Hanson Concrete Garages all this comes as standard. 10 Year Guarantee, giving you peace of mind knowing that you are covered against any structural faults. Hanson Concrete Garages Customer Charter, ensuring that you receive the best possible service. UNIQUE PANEL DESIGN – cleverly designed overlapping panel joints give a weatherproof seal. Panels bolted together with three galvanised bolts, other competitors use only two – extra strong. Attractive Multi Spar aggregate external finish on the panels, designed to blend with most UK properties. Flexible range, probably the most flexible in the UK. Tell us what you want and we can normally build it! Widths as standard up to 30’3″, length as long as you like, with height up to 16ft. Fully trained Driver and Installation teams, employed not sub contract, with quality control procedures in place to ensure consistently high standards for you. Fitted with market leading Hormann steel up and over door, pre framed to ensure ease of use. All timber components, windows, fascias and verge boards are factory treated by being fully dipped in preservative after assembly, to prolong their life. Nice people to deal with! – “The answer is yes, now what’s the question?” – it’s good to feel wanted as a customer! Market leading fibre cement roof sheets, up to 20% thicker than some suppliers, guaranteeing you longer life AND with a choice of 5 colours, if you want. Recommend a Friend scheme – earn Marks & Spencer vouchers when you Recommend A Friend or Family member. Hanson Garages guarantee the structural integrity of your new concrete garage for 10 years from the date of installation. If any structural component fails in your concrete garage, we will either replace it, or carry out a repair free of charge. The guarantee is subject to maintenance being carried out in as described in the Care and Maintenance instructions issued when your building was built. Click to download our Customer Care Pack. For further details on our comprehensive guarantee – call 01977 695111 or contact us online and we will be happy to answer your questions.